The word “meeting” sounds so boring, so why would anyone, parent or child, want to do one?! 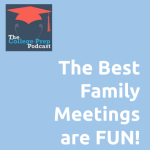 This week on the podcast, Julie Smith debunks the myth that meetings aren’t fun, and provides a number of tips for how — in only 10 minutes a week! — families can save time, eliminate scheduling headaches, and create more connection and fun. Julie’s case for the anti-boring family meeting was so persuasive that co-host Megan Dorsey, who came into the discussion a little skeptical, decided that she might implement her own unique version of the family “check in” in her household. Julie Smith is an adolescent and family counselor who partners with parents and community organizations to navigate the unpredictable world of tweens and teens. She specializes in developing strategies that actually work to support adolescents and families before, during and after a crisis. Find out more at juliesmith.com, or connect with Julie on Facebook and twitter. « 002: College Admissions Timeline: Are You Behind Yet?